Monster Truck Madness 2 is the sequel to Monster Truck Madness by Microsoft Studios, with updated visuals, sounds and engine giving you the ultimate monster truck experience.There are multiple modes, trucks, levels and driving conditions to choose from. 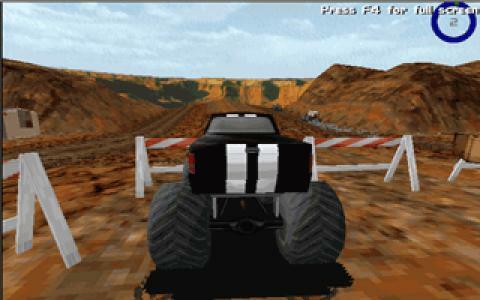 As you progress through the game you'll become to realise that control is everything, remember Monster Trucks are rather heavy machines and takes a long time to make to make a turn. This is what makes the game unique, it seems Microsoft Studios really took the time into researching the matter. Don't let that frighten you away though, the gameplay style is still arcade. For the time, the lighting effects really played a good part in the game, especially when you're driving in pitch dark jungle like areas. As you have no minimap it's usually the best to stick to the path given or follow one of your rivals and overtake at the last second. This is a checkpoint ran racer, even though there is no set time limit you must go through the checkpoints in order to keep your position, just like 1nsane if you ever find yourself in a sticky situation you can always call the rescue helicopter or dinosaur? to get back in the action. There are a large variety of trucks to choose from right from the get go, and the amount of operations on the trucks are awesome. You can use your horn while you get huge air, flash your headlights and if your truck has extra lights you can use them to stand out from the crowd ;). As driving conditions change you'll need to your lights to help you out, it's all about the night racing, but also for the upcoming bad storms. 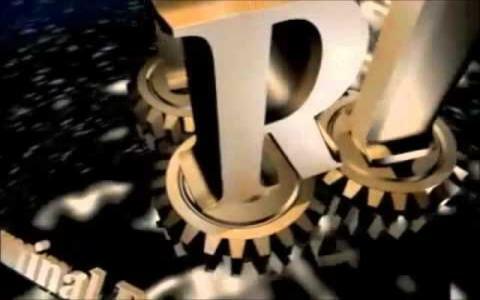 The visual effects in this game for time of Windows 98 were fantastic, lighting, pitch dark night shadows, stormy weather you name it you'll know about it. 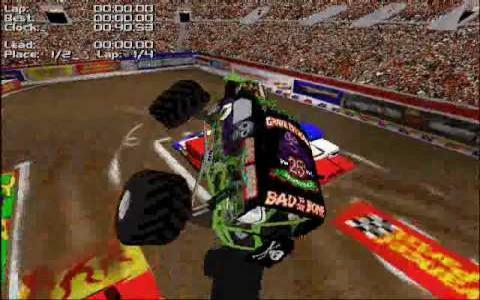 As many games at the time didn't really pay attention to physical and cosmetic damage to your machines from collisions, Monster truck Madness 2 as that all covered with great amounts of detail. Whether you're up for some off-road action or just to show off Monster Truck Madness 2 has great amount of features that will cover all your needs.